Indestructible: Is the toy considered indestructible? We’ll let you know how if the toy is labeled as such so you can make a more informed purchase. Guarantee: Will the company replace the toy if it is destroyed? We’ll let you know what kind of warranty is available in the individual descriptions. Material: What is the toy made out of? We’ll let you know if these tough dog toys for aggressive chewers are made from rubber, nylon, or something else. Made In: The country of origin of your pup’s new toy can be important; we’ll let you know where each one of the ten toys on this list was made. Safety Indicator: Is there a warning system that tells you it’s worn down too much for your dog to continuing chewing? Check the review for more details. Weight: How much do the toys weigh? We will let you know the weight of each of our top ten favorite aggressive chew toys in ounces. Now that all that is out of the way, let’s get gnawing into those reviews! We loved each and every one of these ten dog toys, but there were two that really stood out from the pack. Those are our Top Pick (the best of the best in our opinion) and the Budget Pick (a cheap chew toy that really was awesome in spite of the low price). If you are in a hurry and want some info quick, be sure to check out those two, located in the top two spots. Now, let’s get to those dog chew toy reviews! Want a sweet rubber toy that can’t be beat? The Goughnuts Original Chew Ring is a nearly indestructible (and guaranteed!) chew toy for every the strongest of chewers. It’s one of the best indestructible dog toys we’ve ever seen. Made from durable rubber in the USA, the Goughnuts dog chew toys come in a variety of fun colors for your favorite pooch. These were designed by mechanical and polymer engineers to ensure the best chewing experience for your strong-jawed companion. But our favorite part of the amazing Goughnuts Original? The safety feature that is built in! 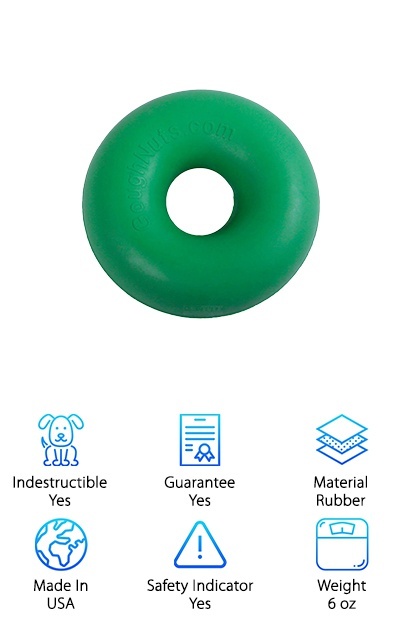 Under the colored outer covering, there is a safety layer of bright red rubber to let you know if your pooch has breached the surface and the toy is no longer safe to be played with. So if you want a safe, fun toy for your favorite furry friend, check out Goughnuts! 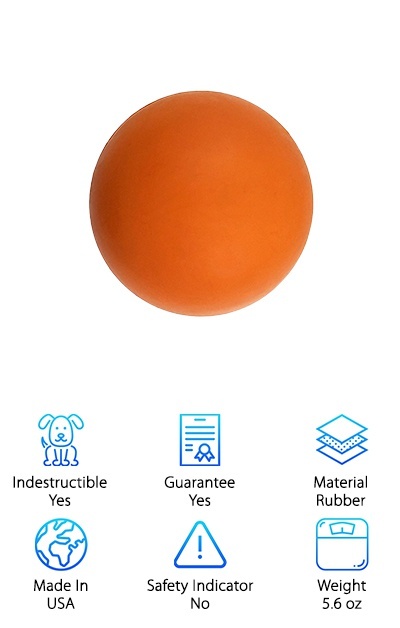 Looking for an indestructible ball on the cheap? The Monster K9 Dog Ball is a bouncy, fun rubber ball that is nearly impenetrable, even by the most aggressive chewers around! 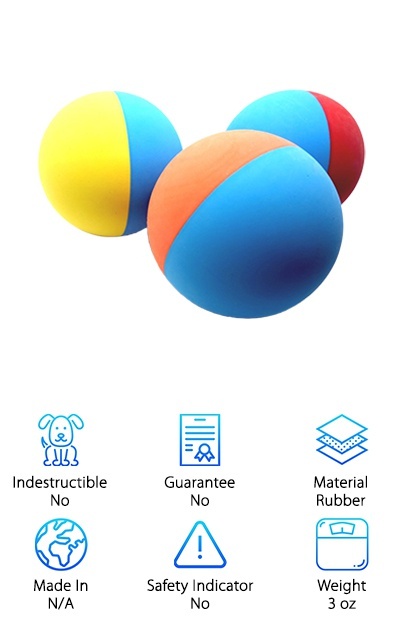 This ball is designed for safe and fun play. It’s about the size of a baseball, making it great for most large breeds. It’s backed by a lifetime guarantee too, so you know it has to be awesome. 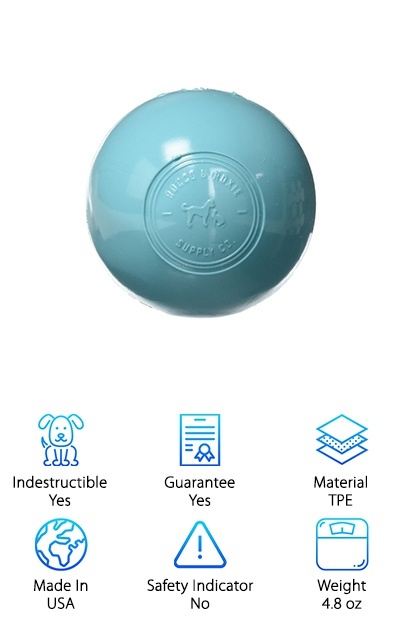 This ball is 100% non-toxic, making it just as safe as it is great to play with. So if you need one of the best dog toys for aggressive chewers and you don’t want to spend a fortune, the Monster K9 Dog Ball is a great way to go. And the best part? It’s not hollow on the inside, so you get a truly solid ball with tons of play hours ahead of you! Want a super colorful ball that you’ll never lose at the park again? Then the Snug Rubber Dog Balls three pack is a great choice for you! The bright, tri-colored design is easy to see and makes outings with your dog even more enjoyable. They are made of rubber that is super easy to wash, even if your play has ventured into the water or the mud. The Snug Rubber Dog Balls are BPA free and made from 100% rubber, making it safe for your dog to chew on. It even floats, so it’s perfect for playing fetch in water with your furry friend! These really are some of the best dog toys for strong chewers around in our opinion. And we think you and your dog will love them too! The West Paw Zogoflex Hurley is a super durable toy for dogs. Made in the USA, these toys are designed to be super safe; it’s made from BPA-free, Phthalate-free, and latex-free materials that are non-toxic. Even if your pup eats a little bit of it, the pieces won’t hurt them. And you know that the best dog chew toys for aggressive chewers focus on safety! The West Paw Zogoflex Hurley is designed to float, so it’s perfect for playing in the water. It’s bright colors make it easy to spot too. We love its destruction-free guarantee. But that isn’t even the best part! These amazing toys come in a variety of sizes and colors. Every single one is dishwasher safe and is even 100% recyclable! 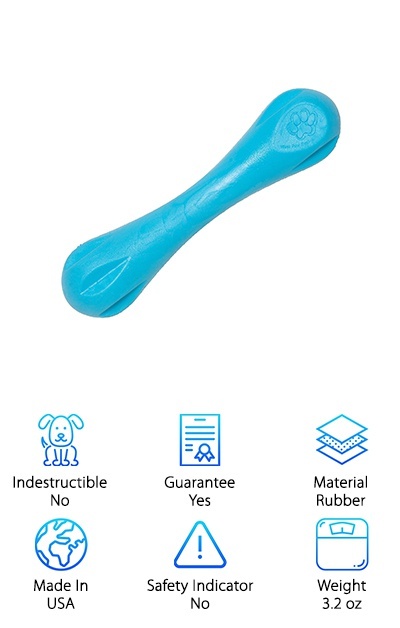 So if you need an eco-friendly toy, check out the West Paw Zogoflex Hurley. Our Top Pick was one of many fantastic Goughnuts products, and we have a second one for your enjoyment! The Goughnuts Indestructible MAXX is the strongest chew toy we’ve ever seen. It’s guaranteed for life! This heavy and large toy is designed for the biggest and strongest dogs and can hold up against some immense pressure from big jaws. If you want a durable, strong, and heavy toy, this is one of the best we’ve seen. 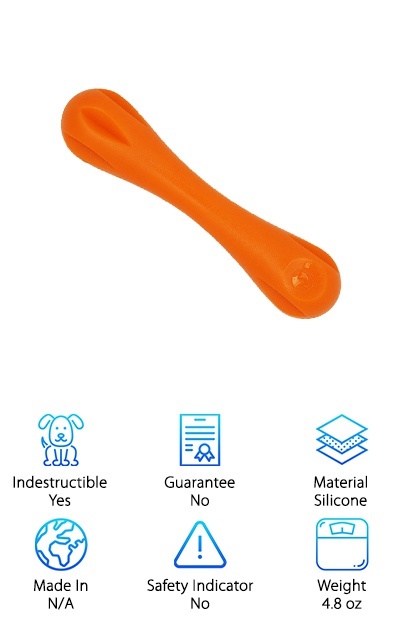 And it even has a patented safety indicator on the inside, so you will know if your pooch has chewed passed the outer layer. These amazing toys come in two levels; the MAXX and the even stronger MAXX 50. They come in rings and sticks, so your dog can get the perfect toy for them. The Aizara Tough Rubber Bone is ready for your aggressive chewer! They come in two, easy-to-see colors (bright sky blue and orange). These amazing bones are designed to help prevent destructive chewing around your home. They work by giving your pooch a strong, nearly-indestructible toy to work out all of their chewing instincts to help protect your furniture. If you have an aggressive chewer, the Aizara Tough Rubber Bone can help to keep their chewing to just their toys! This flexible toy also floats and bounces; its bright colors also make it easy to find. And it even helps to fight plaque and tartar build-up on your dog’s teeth, giving them a healthy, glowing smile. Not to mention this toy is incredibly easy to keep clean. So if you need a great toy, check out the Aizara Tough Rubber Bone! Looking for a toy that comes in a variety of sizes for your pup? The Nylabone Dura Chew Bacon comes in a variety of sizes, ready for your puppy or your small dog, all the way up to your biggest furry friend. Scented and flavored to mimic bacon, this chew will draw them in and keep them occupied. 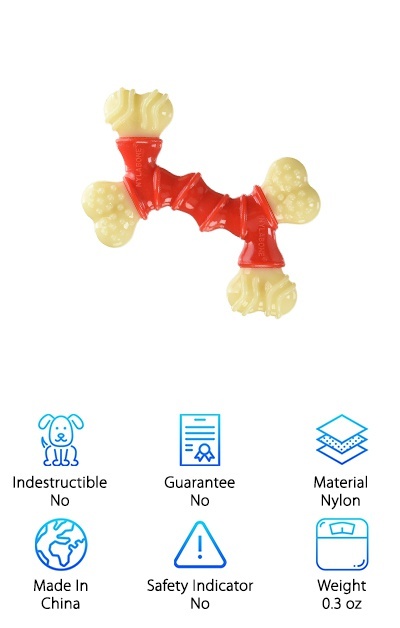 The Nylabone Dura Chew Bacon is designed to help keep your pups interested in chewing their toys instead of your furniture, teaching your dog great, non-destructive chewing habits that can last a lifetime. The strange shape gives your dogs different textures to chew on that helps fight toy boredom. All that, and this amazing bone also helps to keep your dog’s teeth healthy and strong! There’s nothing about this super durable toy that we don’t love! Does your dog crave a little flavor? The Pet Qwerks Flavored BarkBone comes in two different flavors: peanut butter and mesquite chicken. 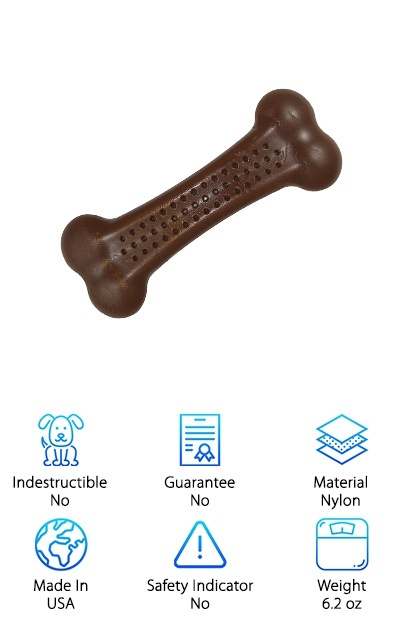 Infused with tiny “flavor cells,” this bone will keep your pup entertained; all you do is spread the flavor spread into the little divots on the sides of the bone, making it difficult for your dog to get all of the yummy flavor out. It will keep them entertained for hours! And once they are done chewing for the day, you can just pop the bone right into the dishwasher and get it spotless for the next day’s chewing! It works with any dog-safe spreads you might have at home too! So if your dog gets bored without some yummy flavors and scents to keep them occupied, the Pet Qwerks Flavored BarkBone might be the best for your furry best friend! The Rocco & Roxie Dog Ball is a super fun toy that is also safe! It’s made from incredibly durable and non-toxic TPE (Thermoplastic Elastomer) that is really strong; the manufacturer claims that it can hold up to even the strongest of jaws! It contains no phthalates, latex, or other toxic stuff. It’s so durable, it’s been reviewed byt some of the most aggressive chewers (and by that we mean the manufacturer gave it to their super chewer, Rocco the Dog). The ball survived! 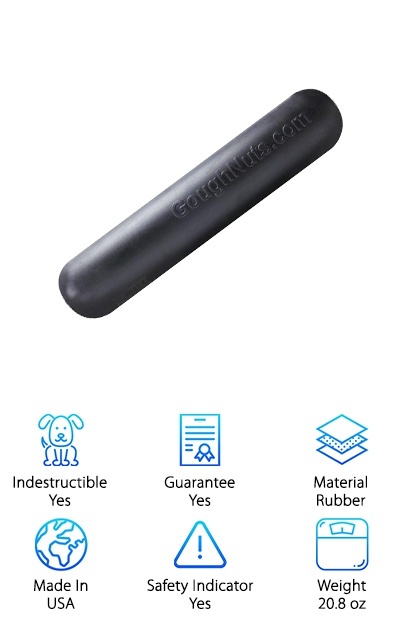 It’s 100% guaranteed to be indestructible. These balls come in two different sizes and colors, great for medium or large dogs. So if you want a toy that pretty much no chewer can destroy, check out the Rocco & Roxie Dog Balls; they are colorful, fun, durable, and super safe! It’s nearly impossible to talk about dog toys without talking about Kong. This company has been making safe and fun toys for pups for more than forty years and have always been a trusted name in chew toys. 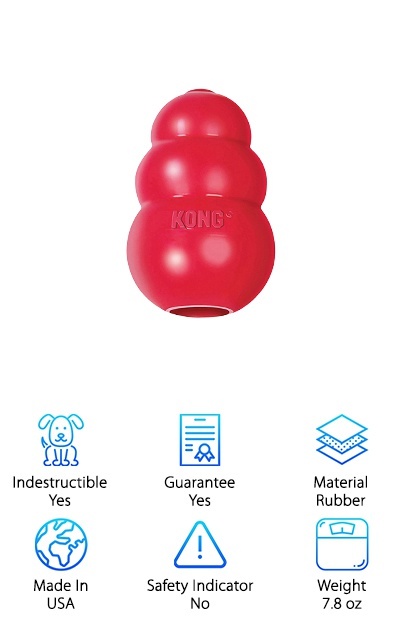 The Kong Classic Dog Toy is the original, indestructible rubber toy. The inside is hollow, ready for treats or dog-safe spreads to make the fun last even longer. It bounces too, making it perfect for even your most active dogs. The Kongs are designed not only to be strong, but they are also made to keep your pooch entertained for hours, stimulating their brains as they work to get at the treats inside. It also helps to fight destructive chewing by giving them something fun and interesting to play with instead of your stuff!